After three years of super hard work, today is the end of an era. Assuming I pass my final module, today I completed the very last piece of my master’s. Phew. It’s had its ups and downs – the Health and Safety assignment wasn’t the highlight of the course for me – but the research I’ve done over the last year for my dissertation has been hugely fulfilling and rewarding (thank you to the many of you who helped me with this). But it’s also done something else. I had a forced break from blogging when the extended ‘screen time’ during the write-up of my dissertation prompted some pretty awful eye-strain-related headaches. But the written part of my dissertation went in in June, so what’s happened since? I guess I’m in a bit of a different place. I think the learning I’ve done was so intensive that blogging, by comparison, doesn’t quite excite me as it did. I’d probably got to a point where my blogging formula had really exhausted its utility to me (primarily as a learning tool, as I thought through each garden I visited). Of course I can still learn from each and every garden I visit, but the intensity of learning probably isn’t what it was and I feel I’m ready for something new. But what? I’ve spent the last three years dissecting literally hundreds of gardens as I’ve written my blog and I’ve loved every single minute of it. But I think I’ve got to the point where I’ve learnt so much, I’m ready to do something different with that learning. Perhaps move from being externally focussed to be internally focussed. Perhaps use all that learning and excitement and energy to make my ultimate garden. On the very day that I handed my dissertation in, Paul and I moved into our new home in Oxfordshire. I’ve been pretty besotted ever since – with our new home, our new garden and of course, with my not-so-new-but-still-ever-lovely husband! Can you spot the white-chested stoat, just to the left of the pillar, centre-right-ish? The garden is such a dream. I just walk around it on a cloud. It feels so magical. With four acres there is an infinite amount of work to do, yet I love it just how it is; nettles, bindweed, ground elder and all. Everyone else seems to walk around it in horror: how am I ever going to get it under control? But I feel no horror at all. The closest to horror is a concern that I might accidentally take away some of the magic along with the nettles, so I’m just slowly, slowly, peeling back one layer at a time, finding more treasures with each passing day. And each day my vision becomes clearer, my confidence grows and my excitement ratchets up another level. I didn’t believe it at the time, but something has changed. It’s as though a switch has been flicked. I just want to be in my garden. I want to care for it, beautify it, nurture it and feel it nurture me in return. It feels an entirely different depth of relationship to the ones I’ve had with previous gardens. Is this true garden-love?! If my priorities have changed, do I blog about my garden? I certainly have so much to learn there; writing it down would surely magnify this learning. Or do I just want to ‘be’ in my garden? To not feel the pressure to analyse and evaluate and report and photograph? I also feel a certain amount of uneasiness about posting primarily about my garden. As if it’s too much like blatant marketing, or ‘like’-seeking, or looking for approval in one way or another. It’s much more personal when it’s about your own private space, as opposed to the learnings from others’. I’ve had several very thoughtful emails from blog readers, asking if I was OK in my virtual absence. And one came through yesterday, that made me take stock. What my blog (and my dissertation) has taught me, is that writing things down helps to clarify my thinking, so given my uncertainty of where to go next with my blog, it seemed a great time to get writing. The answer hasn’t yet ‘binged’ up at me on the page, but I’m sure my subconsciousness will process my thoughts much better for having written this post and when I least expect it – just as with the very final piece of any design – the answer will indeed appear. I still love the deer…but will this last? Lovely to hear from you. Dunedin is definitely on my travel list. I’ve driven from Russell to Wellington in the north and Christchurch to Queenstown in the south but not yet made it to your part of NZ! I must try to put that right as I am quite in love with your country. I walked the Heaphy Track on my last visit and it was quite out of this world. Thanks for your big-garden advice. It’s such a very different type of gardening to suburban gardening, isn’t it? Although I’m definitely glad to start in the UK where we have such reliable (there are other words for it) rain, so at least watering is one thing I don’t have to think about too much. But I’m sure I’m going to have lots of fun – one thing you probably have worked out about me is that I love learning and there’ll almost certainly be plenty of that! That’s great to have a recommendation, thank you! It sounds absolutely wonderful. I adore travelling in New Zealand – not just for the walking and scenery and wildlife (which is all amazing) but it’s just so easy and friendly and the food is always exceptional. The whole package is just my idea of heaven! Can’t wait to get back. Wonderful to hear you are enjoying your garden so much Janna and I can empathise with you. I remember my first 2 acre garden – it was all so exciting I would rush outside every morning for a quick tour to see what new treasure had popped up from the soil. Everday was a new an horticulturally exciting day.I hope all goes well for you and you continue to enjoy your new life. It also looks like Paul has certainly been enjoying his new mower. You noticed the lawn is slightly shorter than when you were here: he loves the ride-on! It’s fun that we can both work in the garden together and do the bits each of us enjoy most. The only trouble with the ‘everyday is a new and horticulturally exciting day’ thing is that I do spend quite a lot of time surveying (in the most unproductive sense of the word) and at some point I need to alter the ratio of observing to doing! I wonder when the morning tours will no longer seem so essential? Or maybe that’s all part of the fun in the long term? Sureveying you Kingdom is the best part of it Janna – I still do it all the time it is also how you get to know what will and won’t work in the longer term. And anyway it takes a lot of very hard work to create a large garden so we deserve the fun bits too. Ooo, do I have a kingdom? That’s exciting!! I do think I make an awful lot of plans that way, but Mum says I do far too much thinking and not enough doing!! I guess I’ll work out the right balance between the two as we go on, but yes, it should be fun, shouldn’t it? Your garden looks beautiful Janna. I empathise completely with your love of your new garden/wilderness, having experienced that love affair for over 40 years here at 149. It’s been great fun sharing your experiences and thoughts through you blog over the past three years and consequently I have learnt a great deal about the process of gardening. Your words of wisdom have helped me refine many elements of my garden and I feel more confident in doing things ‘my way’. With regards to future blogs, may I say that my favourite blog posts (and I now read quite a few) are those that follow a bloggers personal project. The inception, actions and eventual outcome, with all the highs and lows along the way, are always interesting. It normalises gardening; it’s not instant; bad things happen; compromises must be made. I never feel the blogger is seeking kudos. After all, isn’t undertaking new projects what real gardeners do? Hmm, yes, I can see what you mean about personal posts, Suzanne. Probably the key difference between blogging and most other forms of writing is exactly that…it is personal. So focussing on that is surely a positive. Thank you for helping me see it in a different light. I can just imagine when you arrived at 149 and your excitement, just like mine. If I can create something half as special as yours I will be doing very well. I read an interesting post this week (http://theplanthunter.com.au/culture/thrift-middle-name/) and it reminded me how careful I have to be in keeping the old and as I bring in some new, just as you manage to balance so well. Oh, what fun I am going to have…promise to share it with you! Hi Janna, It was so lovely to see your blog appear in my in box today. I was just thinking the other day of how much I have missed reading your thoughts on gardens. Congratulations on finishing your masters and on the new garden which looks just gorgeous. I think that taking things slowly in a new garden is the way to go as you find little treasures along the way that would have been missed had you rushed in. Enjoy your garden and the reduced pressure, but do keep blogging, we all enjoy it so much. You are kind, Jill! I have to say, it’s super nice to be in touch with people again. Yes, slowly, slowly, catchy monkey, as they say! Mind you, I always seem to take on two new things for each one I finish, so slowly, slowly is realistically the only way I’m going to make progress across a garden this size! At the moment I’m looking at sofas – decided it was all very well spending every spare moment in the garden but as the nights are drawing in we really need something to sit on inside! But I do feel a reduced pressure having completed my studies, so I’ll focus on enjoying that and keep some time aside to continue my blogging. I’m excited for all the possibilities ahead for you. I agree writing is a great teacher, especially when writing for others, because more care is taken. But sometimes it’s better to think and feel, rather than articulate. Enjoy these days of bliss and sunshine. You offer such wisdom, Marian. Thank you. It’s very good to hear from another blogger that sometimes it IS good to stop and think and feel and not put everything into writing. Balance is the key to so many things. I’m feeling so much clearer already. What an exciting time, and you are so right to feel your way into it, under no obligation to do anything in particular. Criss-crossing the personal and the outside world is what my garden is to me…and I wobble or move from one perspective to another all the time. Interresting too that I rarely show photographs of the longer views in my garden as it seems too personal somehow…but writing is a great soother, and challenger, even though I don’t always reveal very much personally. I think my blog is entirely for me really….it’s a happy accident if anyone reads it and I am always surprised by responses, as if they are not quite real. And more very wise and helpful words, Alison. Thank you so much. I’m glad you think it’s OK to wobble on things!! I think your approach of ‘write your blog for you and it’s a real bonus if someone reads it’ is a very healthy one to have. Thanks for your encouragement; I will keep going ‘in whatever way comes to me’. That’s the second pearl you have given me: don’t force it, just go with whatever seems the natural thing to do at each point in time. Congratulations on your milestone achievement , but much more than that , best wishes for a most delightful new phase of life in such a beautiful setting.! Managing Editor of a provincial newspaper , to just editor, then features editor , then ” looker-afterer ” of the editorial & letters page etc, to 3 days per week , eventually half a day per week on site , and then finally to only writing his Saturday column and sending on-line. When he finally pulled the pin , he was (after 65 years employed as a journalist by various iterations of the same employer ) somewhat lost , but the pressure of deadlines and physical challenges had got the better of him . The family gathered and said – you CAN still write for anyone who wants to read it – with so much more ease and reach. , and we ste up a blog for him . The thing is , with a blog , you can write whatever. , whenever , how much , and how frequently you choose!! It was wonderful to see h be able to continue as with the removal of the pressure he enjoyed the roves so much more. So , my advice in your current dilemma would be to take advantage of the best aspects of the interwebs , and just do it when joy feel like it! You can rest assured that we who have enjoyed your writings until now will be must excited when we see another post pop randomly ,or regularly , into ourinbox – especially when It comes with delectable photo is of your gorgeous garden to drool over attached ! Ps At 88 , the blog has stopped too. dad just scratches out a little bit of poetry , in very large , shaky longhand, as the muse drops by to visit on occasions…. I love this! You’ve brought your message to life by laying out the story of your father so beautifully… you clearly take after him with your writing skills! You are so right, I don’t need to decide what I’m going to write about or how often or in fact anything at all. With my blog, I can just write what I want, whenever I want to…and probably write all the more fluently for it. Thanks for your encouragement and please say hi to your father for me: you can tell him what an inspiration he has been (along with yourself) for another keen writer over here! Hi Janna , just read your latest post – New Year 2019 – and am SO delighted that you have commenced blogging again . !!! I checked back to this one as I couldn’t remember when this exchange took place , asvindidntcwanand I didn’t want to bore you with the same piece of news twice, but I see that it was late in 2017 . That was before our big news had confirmed itself , but now that you are “back” , I am ecstatically excited to tell you that I am SO in tune with your currrent garden status and thoughts , because while you were away , we purchased and in 2018 moved to, a 3.5acre , gorgeous block on beautiful Tamborine Mountain ! It has the old bones of a lovely garden but has been rented for years . Swap nettles for every other weed known to man which will grow in subtropical highlands , multiply it by a gazzilion , and you have our place . ! And we are just in heaven …. 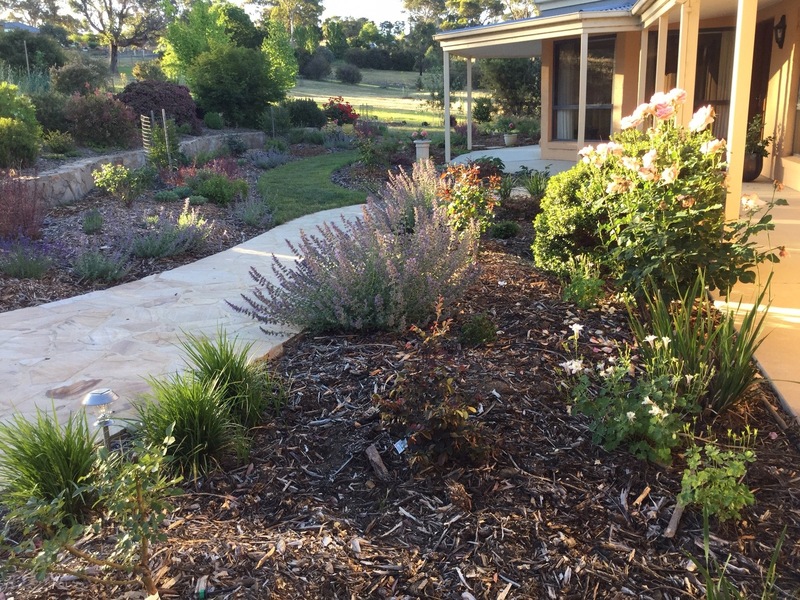 30 metres of red topsoil, level with a very slight slope , a abeautiful bore plus big tanks for the house , usually heaps of rain – (though very dry this summer ), subtropical but cool enough at 530m above sea level to have bulbs & deciduous trees as well….. I wa so excited this weeek to plant 12 pots of one plant, ( white Gaura) to make a lovely big swathe of moving fronds to Break the view of our big watertanks. Coming from 800 sq suburban metres , I’ve never until now had the luxury of planting a heap of one thing for maximum impact ! Also put in 4 tibouchina alstovilles to screen our front “ park “ , so that it is not revealed until we walk up the 3 wide steps and it opens out. It’s just so beautiful and I love it so much . I’ve even given up pining to be the owner of Kiloren , which was the topic of one of the earliest articles of yours that I ever read. !! It was on our way home to Qld from that trip that we decided to bite the bullet , sell up in Bris , and find an acre ( hmmmm – ended up with 3.5!!!) on the mountain. What wonderful news! I’m so excited for you and can hear your enthusiasm so clearly through your words. We can go on this garden-making journey together! We sound exactly the same in our wanting to make something absolutely amazing, but actually just being happy whatever we are able to do in the time we have available. Hope to hear more about your garden as you do wonderful things. Good luck! This comment from Suzanne sums up the way I feel. I’ve been writing about my own garden and about gardens I visit for about 4 or 5 years now. Looking back at older posts about my thoughts, goals, problems encountered and so on is really helpful when I plan a new project (which I do far too often!) — I can sometimes anticipate problems and avoid them, or simply be more thoughtful and careful in my planning. But the best thing, I think, is realizing how I change along with the garden, aiming for different things, in different ways. The challenges in your new garden are exciting and I’m sure you will develop and implement a plan that gives you what you are looking for. I know you’ll encounter problems — who doesn’t? — but I’m equally confident you will find your way through them. Any chance that your thesis will be available for avid readers like me? Knowing that you were writing about the genius of a place makes me very curious. Thank you, Pat. It’s so interesting to hear everyones’ perspectives. I do like the idea of having a bit of a journal as I create my garden and it sounds like I might look back at it more than I first thought. I know I change my thinking on gardens with unbelievable regularity and there would be something nice about being able to track that evolution as it happens. I’d be very happy to share my thesis with you. I’m just waiting for my feedback from the examiners and then I’m going to put a summary together to send out to everyone who left an email address (including you!) on my survey. That might be quite enough to send most to sleep but if you’re feeling very brave and still want more just let me know and I can send you the full doorstop version!! It’s lovely to know you are interested to hear about my findings. Congratulations Janna, on both completing your master’s and finally, finally moving into your new home and garden. And I’m sorry I was unable to help when called upon. Take your time with the blogging dilemma. You’re not alone in feeling a little confused, or at least bemused, as to where to go with your blog. Several long term bloggers I know are struggling (myself included) and some have given up altogether. I hope you don’t stop completely but I’ll wish you all the best whatever. Dxx p.s. I do like a stoat. Aah, thanks David. Good to know I’m in great company with my musings. And aren’t stoats funny things?! I was relying on you to also pick me up on the word (s?) ‘drawing room’. My friend emailed me to say, ‘drawing room? You have a drawing room?’. I do find it hard to use the expression in the same sentence as talking about my own house without falling about laughing, but when (yes, when) you come and visit you’ll see exactly what I mean. You just look at it and it shouts drawing room at you. So drawing room it is. Anyway, enough drawing, back to gardening for us both. Rain, rain go away, please! Congratulations on completing your masters! I too would love to receive a summary (or full-length) of the thesis! Don’t worry too much about the direction of the blog right now – just wallow in the joy of having finished a huge academic project and having a wonderful newly acquired garden to live in and play with. I know I certainly would love to hear how you go about making it your own! The blog can be a record of that journey if you so choose! Thank you Deirdre! And a special thank you for all you did to support my questionnaire. I like the idea of a bit of wallowing and just letting things pan out. I’m sure – now you’ve all helped me think it through – I will continue to post, but perhaps at a slightly slower pace, at least initially. But I’ve finally realised I don’t need a detailed strategic plan…I can just see when the mood takes me. Perfect! Oh Janna I felt such excitement when I saw your email come up in my inbox! I have missed reading your blogs. Firstly, congratulations on finishing your masters. I look forward to reading the dissertation. Well done! After examining, perusing, enjoying, analysing,……..so many gardens and natural environments all over the world, I guess you have a head full of ideas and information! It has been lovely to read of some of these experiences in your blogs. They have certainly given me some things to ponder and some places that I look forward to visiting in the future. Your blogs have enabled me to feel a connectedness to you from a distance. I am secretly hoping that you come to a decision to continue some form of blogging. I do understand your need for change though, as you have grown from this experience. Who knows where it will lead you now! 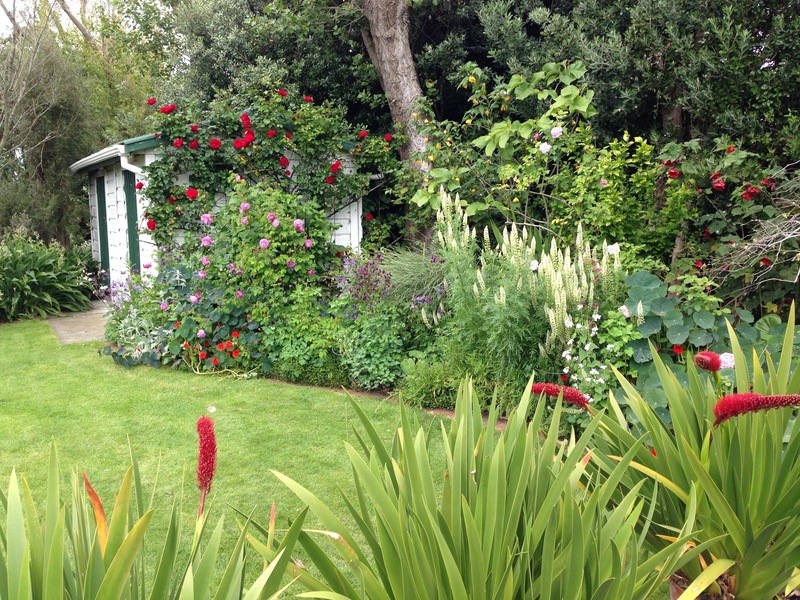 So much to think on when planning and surveying your own garden space. Sometimes one just needs to get started and see how it evolves. You never know what surprises you may uncover. Hopefully I will get to see the fruits of your labour in the coming years. A big thank you for 3 years of fabulous blogging and stunning photos, they always brought a bit of sunshine to my day. For your writing I give you an A+ 😊 Good luck with it all! Thank you, Louise!! I definitely will keep blogging. It just needed a bit of thinking through to see how to make it work and with the help of all your thoughts and perspectives I feel really clear on it now. It’s funny how everything can suddenly slot into place so quickly. I think it’s just having that clarity about why you are writing and then it all flows from there. Thanks for your good wishes; I’ll let you know when I get my final results for my masters and I look forward to sharing the progress in my garden as I go! Oh, Nicola, thank you so much for your lovely message. It’s so touching! You are very right: gardeners are such a lovely, gentle audience. I continue to be amazed at how thoughtful, generous and kind gardeners are. And it is so lovely to share the joy that we all feel from our little green spaces. I’ve found my clarity, I can see how I can post in a way that is from the heart; losing that formula/agenda/rigidity is exactly what I needed. I’m now raring to go and excited to have found a new path. Thank you ever so much for your help and kindness. Congratulations, you have achieved a lot. You writing and your images stir the soul, absolutely wonderful work. All the best! I hope I am on your list for a summary of your thesis?